Dr. Ponder is back, but our Education Program Manager Gail Buhl is still on Pinzón. She sent some pictures recently, and Dr. Ponder wrote some notes to accompany them. 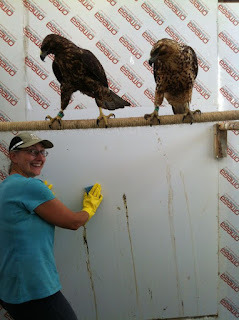 Gail cleaning: Cleaning day also brings out the hawks' natural curiosity. As one scrubs the walls, the residents watch closely. It is important for the humans to be careful - given the poor, lava rock footing in the holding areas, it is quite possible to grab a nearby perch to steady yourself and almost get a hawk foot instead. This image shows both an adult hawk (left - chocolate brown) and juvenile. 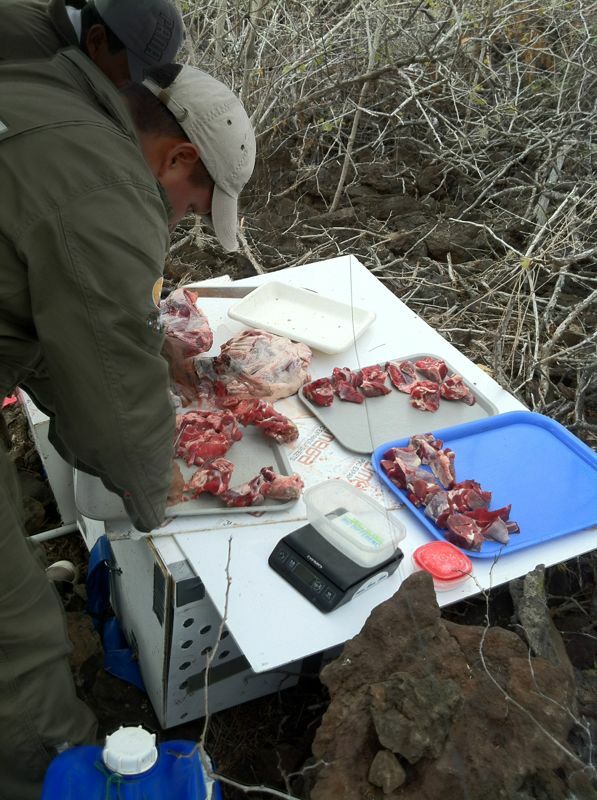 One of our team members, a park guard from the Galapagos National Park, is prepping 10 pounds of goat meat for the daily feeding. Each hawk gets around 100grams of meat a day, although sometimes it is challenging to determine how much is meat and how much is bone. Our management strategy includes frequent weighing of the hawks. For some hawks, it has been a matter of finding "roommates" who do not steal their food. For others, we have to work hard to keep them from getting obese. Perhaps we can guess who is stealing food! 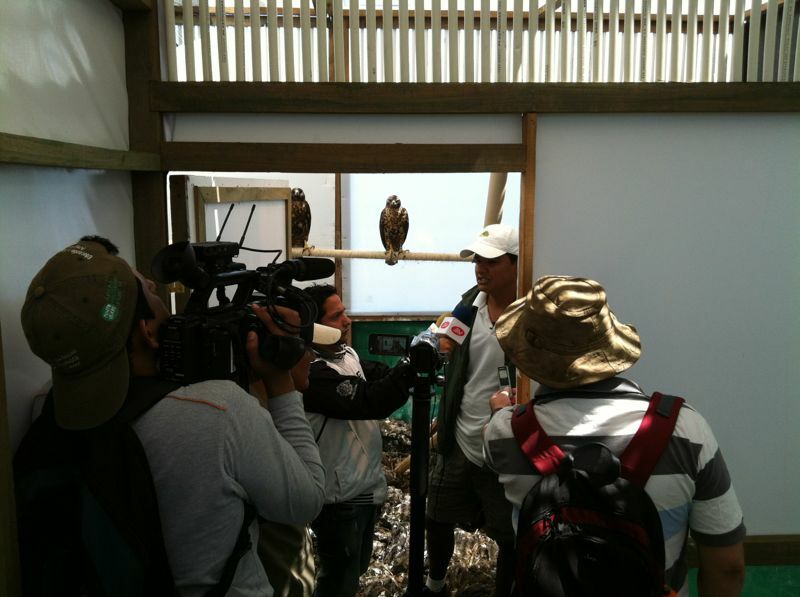 Press gathering: Local media were invited out to Pinzon to see the activity there. The hawks, of course, were a huge highlight as both video and still cameras were pointed their way. While Gail had the ability to be selective in which hawk enclosures she opened, the hawks were their usual curious selves. Excellent portrait candidates! While keeping the birds safe during the active phase of the project is critical, it is equally important to monitor what happens after their release. 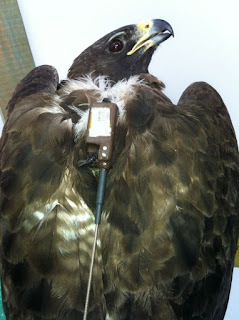 This data will be used both to inform post-release activities and future eradication projects. Post-release activities will include supplemental feeding while the prey base is recovering. thank you Gail it is your turn now. We missed you at the volunteer's Holiday Party.